The following is the full text of a speech given by Mr Ahmed Mujuthaba who headed the first Human Rights Commission of the Maldives. The speech was given at a reception held in honour of Mr Gary Streeter, member of the UK Parliament and head of the British Conservative Party’s International Office, the Conservative Human Rights Commission and Conservatives Abroad. 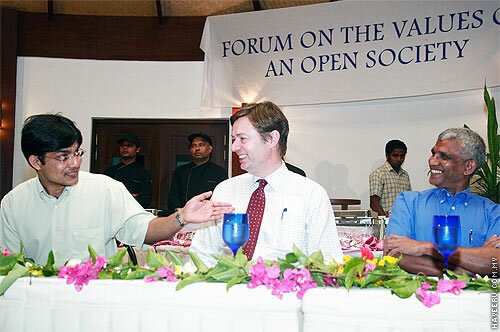 The reception was given by the Open Society Association of the Maldives, which includes many progressive ministers in the Maldive government.The function was held at Bandos Island Resort on 20 January 2007. For the sake of brevity the first (introductory) paragraph has been deleted. We have never had democracy in the Maldives. The present constitution which took 17 years to write is no improvement on the previous one. To see that, all you have to do is read the definition of Law. Law includes acts of Majlis, Government Regulations and Government Practices - practices that can change whimsically. Furthermore there is no practice of publishing these practices. Even several regulations which affect the public go unpublished. The print media was, till very recently, like the Soviet era Pravda or the Peking Review of Chairman Mao days except for a brief period in 1989 and 1990. Long bold headlines such as “President Gayoom Sends Sympathy to the President and Prime Minister of India after Gujarat Earthquake” or “President Gayoom Congratulates Mr Tony Blair on his Election Victory” adorned the front pages. It was not the earthquake or Tony Blair’s election victory. No mention of the plight of the victims or Blair’s promised agenda. You were lucky if more news on the events was given in tiny print in the inside pages. The news on local radio and TV was much the same. The news of the awful death of Ivan Naseem, probably sent using phones smuggled into the prison led to riots on the streets of Male on 20 September 2003. Brutal suppression of prison riots on that day resulted in further deaths. The presidential referendum was not far away. The incident was so revolting that many people overcame their fears and openly expressed their disgust. The self-exiled people living in Sri Lanka and England had ways of passing news to international press. And there was internet. So attention had to be given to promises made in the campaign. That, now I believe, was what led to the birth of the first Human Rights Commission on 10 December 2003. All 9 members decided that it should be honorary, and so it remained till the appointment of members to the Commission, on 27 November 2006 under the current law which entitles members to salary and other allowances. After intense consultation with the Commission, the President promulgated the Human Rights Commission of Maldives Regulations on 24 December 2003. Obviously a Commission formed by Presidential decree did not comply with the Paris Principles. However the UNDP was willing to fund some programs of the Commission which helped in securing some funding from some countries including Britain through the British Council. The members of the Commission except two with law degrees from foreign Universities were new to human rights. So were the staff members. The task ahead was daunting. The Commission moved ahead with determination. By end of April 2004 it had visited places of police detention, the prison, home for people with special needs, home for children in state care and the drug rehabilitation centre and sent its observations and recommendations to respective Government authorities. By end of July 2004 it had organized a one day seminar on human rights and the Human Rights Commission, a 2 day workshop on CRC and CEDAW, a 2 day work shop on sensitising the media on human rights and its reporting and a lecture on human rights in a model constitution. Despite all these activities no one in his or her wildest dreams believed that the Commission was independent and would criticise the Government. This changed dramatically when the Commission gave for publication its findings on the detainees of August 12 and 13, 2004 protests. The Commission paid special attention to them, as under the Emergency declared several of their basic rights were derogated and hence more vulnerable to abuses. From then onwards the Commission’s independence was established with some in the Government and a few opponents. But many saw it as an organization that protected the rights of criminals only. Since I was one of the 42 original signatories in the application to register the MDP in 2001 many in the Government assumed that I was protecting the MDP interests through the Commission. Little did they know the impact made on me by what I saw and heard. Any way I learned more of what was wrong with the country I was born in and call home, in the 1 year and 9 months that I was in the Commission than the entire rest of my life. The state media gave no assistance in dissemination of information when there was so little awareness of human rights. But when one of its members resigned on the grounds of the Commission not functioning in accordance with the Constitution and Islamic Sharia, it was announced on the state media on 9 December 2004. His resignation letter had several accusations against the Commission as a result of which the Commission requested the President to do an investigation and I informed him that I would not attend office till the outcome of the investigation. The President replied on 22 December that he had confidence in the Commission members, and although this was not reported in the state media, I reported back to work on receipt of that reply. After the tsunami struck the Commission had to devote much time in inspecting the shelters for displaced people in particular and conditions of the affected people in general, realizing that displaced people were particularly vulnerable to abuses. It sent its findings and recommendations to the relevant Government authorities.The tsunami had a good effect too. In a sudden gush of generosity, the President released all the August 12 and 13 detainees, stopped further investigations and dropped all charges including that of treason. The Commission monitored the General Election held early 2005 and declared it generally not free and fair and without undue influence and published its findings. This increased the belief in the Commission’s independence. The Commission on 30 June 2005 organized a meeting to discuss human rights in a multiparty democracy. One registered party and all three applicants participated in the meeting and members of the public asked questions. But five days later came the alarming announcement on the state media that the Supreme Council of Religious Affairs had banned the possession of Universal Declaration of Human Rights as long as Article 16 and 18 were part of it. The Council instructed the Commission not to distribute the document without deleting those articles. It looked in the end that the Council which is under the direct purview of the President had acted without his approval. The Human Rights Commission Law was an ordeal. The first bill sent for 2004 parliament was a far cry from Paris Principles. Fortunately, with great pressure from the Commission, it was withdrawn. The revised bill was passed with last minute amendments taking away some essential powers from the Commission. The Commission sent its concerns to the President but he chose to ratify it on 18 August 2005 although it was to be amended. I tendered my resignation immediately. There is a better Human Rights Commission Law now although I don’t know whether it fully complies with the Paris Principles. Now I should like to give my thoughts on the future of our country. We have political parties and their leaders, one of whom is the top judicial authority of the country. We have politicians and activists. We are bombarded with spin from all sides including state media. There is frustration. It is a delicate crossroad where a wrong turn can plunge the country into chaos. Do we want the country to move back to a subsistence economy? Do we want a strong man to emerge to finally control the situation and install a military dictatorship or an Iranian style theocracy or a Saudi type kingdom? If the answer is no, the state radio and TV must become neutral in reporting news and facilitate public debate on various issues, and although the chief aim of a political party is always to reach lawfully a position to run the government and to lawfully retain it, at this moment, the politicians in power must stop trying to cling onto power and those in the opposition must stop trying to gain power and work together to ensure a better life for future generations through a good constitution. When a good constitution is made, it will take a very long time with very hard work to make democracy and respect for human rights a part of our culture.